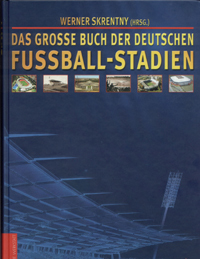 An excellent book that profiles the history and details of some 350 soccer stadiums throughout Germany. Some historically significant but no longer existing parks are included as well, but for the most part, these are existing structures. Everything from the giant 1936 Berlin Olympic stadium to tiny fields with capacity of 5,000. Many photos are included, all black-and-white. Highly recommended as reference and just for general reading.